What Should You Do If Your Elderly Loved One Falls? One in three people over the age of 65 fall each year, causing broken bones, head injuries, and anxiety over potentially falling in the future. Knowing what to do if your senior loved one falls can help keep him or her safe and reduce the likelihood of related complications. Your first reaction may be to move your loved one to a more comfortable position. However, moving him or her can cause more damage to occur, especially if a bone has broken as a result of the fall. 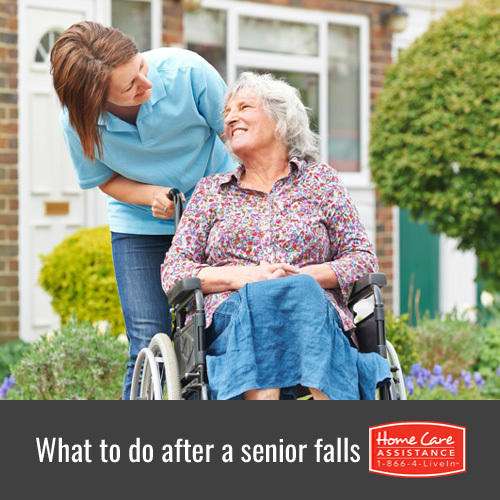 If your loved one is alone when the fall occurs, he or she can try to get up by gently rolling over. If your loved one is unable to move, he or she should call for assistance. Checking your loved one for injuries or other complications will help you determine what to do next. If your loved one is unconscious and unresponsive, 911 should be called immediately. Check for any bleeding and apply light pressure to stop the blood if there is a wound. Stay by your loved one’s side until help has arrived. If your loved one is conscious and alert, make him or her comfortable. Check his or her vital signs, including pulse, skin color, and pupil dilation. Look over your loved one’s body and apply ice to areas that are swollen and wound care for small wounds. Ask if he or she can get up off the floor and help him or her to a standing position if possible. If your loved one is in severe pain or can’t move, call 911 for help. Once your loved one has fallen, the chance of falling again doubles. The fear of falling can also keep your loved one from doing activities he or she once enjoyed. Make sure your loved one’s doctor is aware of the fall so he or she can assess injuries in a follow-up examination and help relieve the anxiety and fear your loved one may have about falling again. You may also want to hire a live-in or part-time caregiver in Guelph to assist your loved one with mobility. Turn to Home Care Assistance for help keeping your loved one safe while he or she ages in place. In addition to mobility assistance, our caregivers can also help with a wide variety of daily tasks, including exercise, cooking, and bathing. 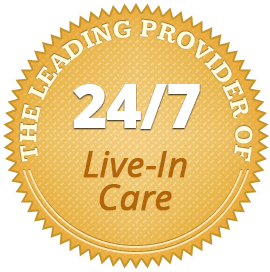 For more information on in-home care Guelph families trust, call one of our experienced Care Managers at (519) 954-2111 to schedule a free in-home consultation.